I’m still feeling brain dead after the final push for submitting. Speaking of NSF, here’s the one figure I managed to shoehorn into my research proposal. If you’d like you can even click here to be able to play around with the figure yourself using the CoGe interface. Now I’ve got to try to explain what this figure is about. The definition of ortholog boils down to being the same gene in different species. Scientists (like me!) can identify orthologs not just by looking for the most similar gene in another species’ genome, but also looking at synteny, the order of genes on chromosomes. Orthologous genes are in the genomes of two species descended from a common ancestor*, and the genes themselves can both trace their history back a gene sitting on a chromosome in that ancestral species. After the two species went their separate ways, each of their genomes began to accumulate differences (mutations). 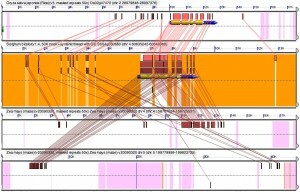 Eventually it can be hard to tell which genes are most closely related to each other, but one of the things that lasts a long time is orthologous genes will has some or many of the same genes nearby on the chromosome, in a similar order to each other, since many genes are still in the same places in the genome as they were in the genome of the common ancestor of both the species being studied. This figure shows a gene conserved between all four regions and the dna surrounding it. 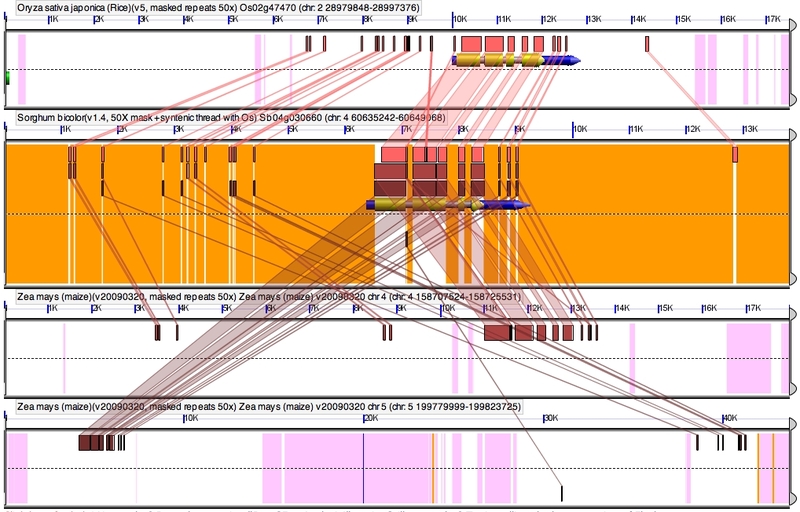 The lines connect blast hits, regions a program (called BLAST) used by lots of biologists as identified as having similar DNA sequences between the the segments from the different genomes. *One of the reasons comparative genomics is a field that wouldn’t exists if the people who don’t believe in evolution were right. **That doesn’t mean maize has two copies of every gene present in sorghum and wheat. Right after getting an extra genome copy (technically two extra copies, since normal diploid organisms have two, one from each of their parents to start with, and maize doubled both) it did. Over the past ten million years the extra copies of many genes were lost, either deleted from the genome or accumulating so many mutations that they stopped functioning. Posted in: biology, research stories.